"The Golden Arrow and Other Tales"
Editor's Note: The author of The Golden Arrow and Other Tales is also an accomplished musician, recording and performing as a professional violinist. She composed and recorded the soundtrack for the trailer for her book, which I am including below. You can check her Facebook page for her performance schedules, new recordings and for additional updates and details on her book release. A forsaken princess must leave her room for the first time in her life... to rescue her father’s kingdom. Three knights are bound to protect a city... by satisfying a ravenous dragon’s thirst for blood. An old widow’s handsome new companion never speaks... but that’s the least mysterious thing about him. An enchanted weapon bestows unlimited power upon the one who wields it... but at a price. In this debut collection of short fiction, Samantha Gillogly weaves a quartet of original tales from the threads of classic European fairy story tradition. Freshly imaginative, yet evoking a bygone era, The Golden Arrow and Other Tales enchants with new stories about timeless archetypes that feel as though they’ve always been with us. Coming May 1st, 2015 from Artistic Media Associates, Inc.
Like most of us here, while I adore classic fairy tales, I’m always curious about new ones. So imagine my excitement when I was given the chance to read The Golden Arrow and Other Tales by Samantha Gillogly--a collection that I can sum up in one word: delightful. Four stories weave together classic motifs and I quickly fell in love with each character, even the dastardly ones, because they were at once both familiar and new. Gillogly’s anthology cover a wide variety of tones--sometimes enchanting, sometimes ominous, and once or twice they are downright gruesome. However, from the first page, it’s clear she has mastered the fairy tale narrative voice. The first line, “The princess had sight, but she had no eyes”, instantly grabbed my attention. I wanted to read more about this princess who was born with blue flowers where her eyes ought to be and her arduous quest to save the kingdom. Out of all the stories, though, my favorite was Dragonsblood, which includes a monstrous woman (a theme I’m currently studying) and knights straight out of Arthurian tradition. My inner medievalist was thrilled! For other fairy tale scholars, you may be interested to hear I was particularly impressed by the author’s use of the Rule of Threes. It came up multiple times, but always slightly differently so that it never felt boring or repetitive (a tricky thing to do with that particular motif). Incidentally, the author, who is also a professional musician, wrote and performed the music for the trailer. The track, “Telling Tales” is skillfully done, with a distinctive Celtic feel. I think it accompanied the collection well and was very fantasy-esque, which was perfect. If I had to criticize anything about the book, I’d say that the dialogue seemed a bit heavy at times. Since dialogue tends to be sparse in most fairy tales, the amount of discussion Gillogly included in her stories occasionally tripped up the pace. Of course, this is a small criticism and rarely takes the reader out of the action. It truly was a pleasure to read this collection. Gillogly does more than just play with fairy tale themes; she fully engages with them and creates fleshed-out, compelling stories so rich that it’s hard to believe that they were written in this century. 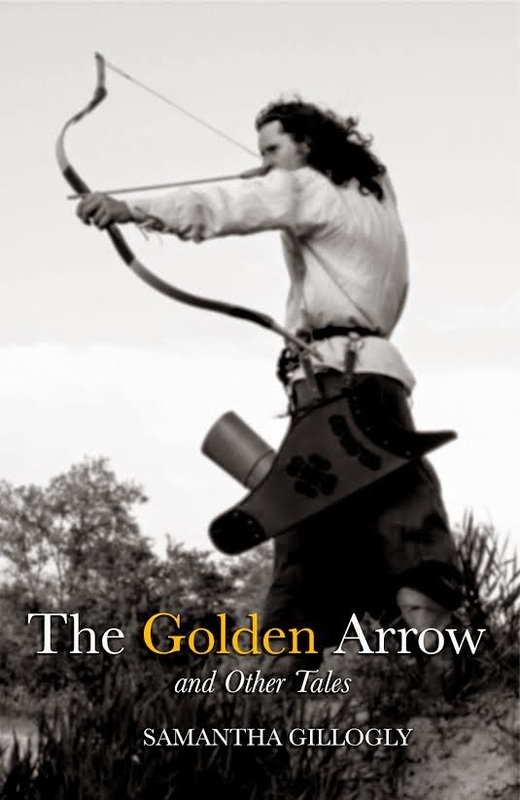 I wholeheartedly recommend The Golden Arrow and Other Tales to any Once Upon a Blog reader. Disclosure: A complimentary copy of the book was provided by the author in exchange for an honest review. Sarah Lawson is currently earning my Master’s Degree in Literature at the University of Rochester and will be writing her Master’s Thesis on the Brothers Grimm. On a non-academic level, she has been working on a series of fairy-tale retellings for about five years.